The ball used in American football has a pointed prolate spheroid or vesica piscis shape, and usually has a large set of stitches along one side. American football, known in the United States and Canada simply as football, is a competitive team sport. The object of the game is to score points by advancing the football into the opposing team's end zone. The ball can be advanced by carrying the ball, or by throwing or handing it from one teammate to the other. Points can be scored in a variety of ways, including carrying the ball over the goal line, throwing the ball to another player past the goal line or kicking it through the goal posts on the opposing side. The winner is the team with the most points when the time expires and the last play ends. However, tied games can occur. Outside of the United States and Canada, the sport is usually referred to as American football (or sometimes as gridiron or gridiron football) to differentiate it from other football games. 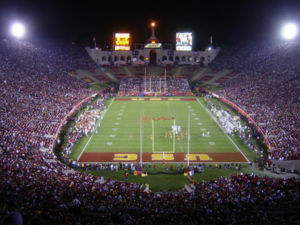 American football is the most popular spectator sport in the United States. In surveys of Americans, pluralities of respondents consider it to be their favorite sport. Football's American TV viewership ratings far surpass those of other sports. The 32-team National Football League (NFL) is the only major professional American football league. Its championship game, the Super Bowl, is watched by nearly half of U.S. television households and is also televised in over 150 other countries. The day of the game, Super Bowl Sunday is a day when many fans host game watching parties and invite friends and family over to eat and watch the game. It is considered by many to be the year's biggest day for "stay at home parties." 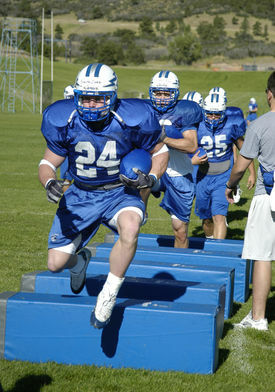 A Colorado State University player runs with the ball as an Air Force Academy player lines up a tackle. College football is also popular throughout North America. Four college football stadiums ( Michigan Stadium, Beaver Stadium, Neyland Stadium, Ohio Stadium), seat more than 100,000 fans and regularly sell out. Even high school football games can attract more than 10,000 people in some areas. The weekly autumn ritual of college and high-school football—which includes marching bands, cheerleaders and parties (including the ubiquitous tailgate party)—is an important part of the culture in much of smalltown America. It is a long-standing tradition in the United States (though not universally observed) that high school football games are played on Friday, college games on Saturday, and professional games on Sunday (with an additional professional game on Monday nights). Certain fall and winter holidays—most notably Thanksgiving and New Years' Day—have traditional football games associated with them. Football is played recreationally by amateur club and youth teams (e.g., the Pop Warner little-league programs). There are also many "semi-pro" teams in leagues where the players are paid to play but at a small enough salary that they generally must also hold a full-time job. The NFL operates a developmental league, NFL Europa, with teams in five German cities and one in the Netherlands. The professional Canadian Football League plays under Canadian rules. The sport is popular as an amateur activity in Mexico and American Samoa and to a lesser extent in Japan, Europe, Korea, New Zealand and Australia. The object of American football is to score more points than the opposing team within a set time limit. American football is played on a rectangular field 120 yards (110 meters) long by 53 1/3 yards (49 meters) wide. The longer boundary lines are sidelines, while the shorter boundary lines are end lines. Near each end of the field is a goal line; they are 100 yards apart. A scoring area called an end zone extends 10 yards beyond each goal line to each end line. Yard lines cross the field every 5 yards, and are numbered from each goal line to the 50-yard line, or midfield (similar to a typical rugby league field). Two rows of lines, known as inbounds lines or hash marks, parallel the side lines near the middle of the field. All plays start with the ball on or between the hash marks. At the back of each end zone are two goal posts (also called uprights) that are 18.5 feet (5.6 m) apart (24 feet (7.3 m) in high school). The posts are connected by a crossbar 10 feet (3 m) from the ground. Each team has 11 players on the field at a time. However, teams may substitute for any or all of their players, if time allows, during the break between plays. As a result, players have very specialized roles, and almost all of the 46 active players on an NFL team will play in any given game. Thus, teams are divided into three separate units: the offense, the defense and the special teams. A standard football game consists of four 15-minute (typically 12 minutes in high school football) quarters, with a half-time intermission after the second quarter. The clock stops after certain plays; therefore, a game can last considerably longer (often more than three hours in real time). If an NFL game is tied after four quarters, the teams play an additional period lasting up to 15 minutes. In an NFL overtime game, the first team that scores wins, even if the other team does not get a possession—this is referred to as sudden death. In a regular-season NFL game, if neither team scores in overtime, the game is a tie. In an NFL playoff game, additional overtime periods are played, as needed, to determine a winner. College overtime rules are more complicated and are described in Overtime (sport). Advancing the ball in American football resembles the six-tackle rule and the play-the-ball in rugby league. The team that takes possession of the ball (the offense) has four attempts, called downs, to advance the ball 10 yards towards their opponent's (the defense's) end zone. When the offense gains 10 yards, it gets a first down, or another set of four downs to gain 10 yards. If the offense fails to gain a first down (10 yards) after 4 downs, it loses possession of the ball. Except at the beginning of halves and after scores, the ball is always put into play by a snap. Offensive players line up facing defensive players at the line of scrimmage (the position on the field where the play begins). One offensive player, the centre, then passes (or "snaps") the ball between his legs to a teammate, usually the quarterback. By running with the ball, also known as rushing. One ball-carrier can hand the ball to another; this is known as a handoff. By throwing the ball to a teammate, known as a forward pass or as passing the football. The forward pass is a key factor distinguishing American and Canadian football from other football sports. The offense can throw the ball forward only once on a play and only from behind the line of scrimmage. The ball can be thrown, pitched, or tossed sideways or backwards at any time. This type of pass is known as a lateral and is less common in American football than in rugby league or rugby union, where only backwards passes are permitted. A forward pass flies out of bounds or touches the ground before it is caught. This is known as an incomplete pass. The ball is returned to the original line of scrimmage for the next down. The team fails to get a first down— i.e., they fail to move the ball forward at least 10 yards in four downs. The defensive team takes over the ball at the spot where the play ends. A change of possession in this manner is commonly called a turnover on downs. The offense scores a touchdown or field goal. The team that scored then kicks off the ball to the other team. The offense punts the ball to the defense. A punt is a kick in which a player drops the ball and kicks it before it hits the ground. Punts are nearly always made on fourth down, when the offensive team does not want to risk giving up the ball to the other team at its current spot on the field (through a failed attempt to make a first down) and feels it is too far from the other team's goal posts to attempt a field goal. A defensive player catches a forward pass. This is called an interception, and the player who makes the interception can run with the ball until he is tackled or forced out of bounds. After the intercepting player is tackled or forced out of bounds, his team's offensive unit returns to the field and takes over at his last position. An offensive ballcarrier is tackled, forced out of bounds, loses the ball out of bounds, or commits certain penalties in his own end zone. This rare occurrence is called a safety. A touchdown (TD) is worth 6 points. It is scored when a player runs the ball into or catches a pass in his opponent's end zone. A touchdown is analogous to a try in rugby with the major difference being that a try requires the player to place the ball on the ground. After a touchdown, the scoring team attempts a conversion (which is also analogous to the conversion in rugby). The ball is placed at the other team's 3-yard line (the 2-yard line in the NFL). The team can attempt to kick it over the crossbar and through the goal posts in the manner of a field goal for 1 point (an extra point or point after touchdown (PAT)), or run or pass it into the end zone in the manner of a touchdown for 2 points (a two-point conversion). A field goal (FG) is worth 3 points, and it is scored by kicking the ball over the crossbar and through the goal posts. Field goals may be placekicked (kicked when the ball is held vertically against the ground by a teammate) or drop-kicked (extremely uncommon in the modern game). A field goal is usually attempted on fourth down instead of a punt when the ball is close to the opponent's goal line, or, when there is little or no time left to otherwise score. A safety is worth 2 points. A safety is scored by the defense when the offensive player in possession of the ball is forced back into his own end zone and is tackled there, fumbles the ball out of the end zone, or commits intentional grounding in the end zone. Certain penalties (primarily blocking fouls) by the offense occurring in the end zone also result in a safety. Each half begins with a kickoff. Teams also kick off after scoring touchdowns and field goals. The ball is kicked from a kicking tee, which is made from the team's own 30-yard line in the NFL and from the 35-yard line in college football. The other team's kick returner tries to catch the ball and advance it as far as possible. Where he is stopped is the point where the offense will begin its drive, or series of offensive plays. If the kick returner catches the ball in his own end zone, he can either run with the ball, or elect for a touchback by kneeling in the end zone, in which case the receiving team then starts its offensive drive from its own 20-yard line. A touchback also occurs when the kick goes out of the end zone. Punts and turnovers in the end zone can also end in touchbacks. After safeties, the team that gave up the 2 points puts the ball into play with a punt or placekick from its own 20-yard line. Rule violations are punished with penalties. Most penalties result in moving the football either towards the defense's endzone in the case of a defensive penalty, or away from the defense's endzone in the case of an offensive penalty. Some defensive penalties give the offense an automatic first down. In addition, if a penalty gives the offensive team enough yardage to gain a first down, they get a first down as usual. If a penalty occurs during a play, an official throws a yellow flag near the spot of the foul; additional penalties are signalled by the same official by throwing a beanbag or his hat. When the play is over, the team that did not commit the penalty has the option of taking either the penalty and replaying the down, or the result of the play and advancing to the next down. False start: An offensive player illegally moves after lining up for the snap. Offsides: A defensive player is on the wrong side of the ball at the start of a play. 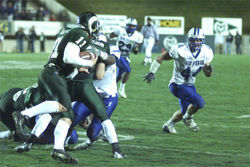 Illegal Block in the Back: An offensive player pushing a player from the opposite team in the back. Some variations on these basic rules exist, particularly touch and flag football, which are designed as non-contact or limited-contact alternatives to the relative violence of regular American football. In touch and flag football, tackling is not permitted. Offensive players are "tackled" when a defender tags them or removes a flag from their body, respectively. Both of these varieties are played mainly in informal settings such as intramural or youth games. Professional, intercollegiate, and varsity-level high school football invariably use the standard tackling rules. The offensive line consists of five players whose job is to protect the passer and clear the way for runners by blocking members of the defense. Except for the centre, offensive linemen generally do not handle the ball. 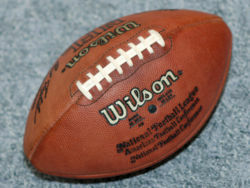 The quarterback (QB) receives the ball on most plays. He then hands or tosses it to a running back, throws it to a receiver or runs with it himself. Running backs line up behind or beside the QB and specialize in rushing with the ball. They also block, catch passes and, on rare occasions, pass the ball to others. Wide receivers line up near the sidelines. They specialize in catching passes. Tight ends line up outside the offensive line. They can either play like wide receivers (catch passes) or like offensive linemen (protect the QB or create spaces for runners). Not all of these types of players will be in on every offensive play. Teams can vary the number of wide receivers, tight ends and running backs on the field at one time. The defensive line consists of three to six players who line up immediately across from the offensive line. They try to tackle the running backs before they can gain yardage or the quarterback before he can throw a pass. In most situations, at least three players line up as defensive backs (commonly known as safeties or cornerbacks). They cover the receivers and try to stop pass completions. They occasionally rush the quarterback. The other players on the defense are known as linebackers. They line up between the defensive line and defensive backs and may either rush the quarterback or cover potential receivers. The units of players who handle kicking plays are known as " special teams". Two important special-teams players are the " punter", who handles punts, and the " placekicker" or "kicker", who kicks off and attempts field goals and extra points. To some fans, the chief draw of football is the strategy that goes on between the two coaching staffs. Each team has a playbook of dozens to hundreds of plays. Ideally, each play is a scripted, strategically sound team-coordinated endeavour. Some plays are very safe; they are likely to get only a few yards. Other plays have the potential for long gains but at a greater risk of a loss of yardage or a turnover. Generally speaking, rushing plays are less risky than passing plays. However, there are relatively safe passing plays and risky running plays. To deceive the other team, some passing plays are designed to resemble running plays and vice versa. There are many trick or gadget plays, such as when a team lines up as if it intends to punt and then tries to run or pass for a first down. Such high-risk plays are a great thrill to the fans when they work. However, they can spell disaster if the opposing team realizes the deception and acts accordingly. Many hours of preparation and strategizing, including film review by both players and coaches, go into the days between football games. This, along with the demanding physicality (see below) of football, is why teams play at most one game per week. American football is a contact sport. To stop the offense from advancing the ball, the defense must tackle the player with the ball by knocking him down. As such, defensive players must use some form of physical contact to bring the ball-carrier to the ground, within certain rules and guidelines. Tacklers cannot kick, punch or trip the runner. They also cannot grab the face mask of the runner's helmet or lead into a tackle with their own helmet. Despite these and other rules regarding unnecessary roughness, most other forms of tackling are legal. Blockers and defenders trying to evade them also have wide leeway in trying to force their opponents out of the way. Quarterbacks are regularly hit by defenders coming on full speed from outside the quarterback's field of vision. To compensate for this, players must wear special protective equipment, such as a padded plastic helmet, shoulder pads, hip pads and knee pads. These protective pads were introduced decades ago and have improved ever since to help minimize lasting injury to players. An unintended consequence of all the safety equipment has resulted in increasing levels of violence in the game. Players may now hurl themselves at one another at high speeds without a significant chance of injury. Unfortunately, the injuries that do result tend to be severe and often season or career-ending and sometimes fatal. In previous years with less padding, tackling more closely resembled tackles in Rugby, with less severe impacts and less injuries. Better helmets have allowed players to use their helmets as weapons. All this has caused the various leagues, especially the NFL, to implement a complicated series of penalties for various types of contact. Most recently, virtually any contact with the helmet of a defensive player on the quarterback, or any contact to the quarterback's head, is now a foul. Despite protective equipment and rule changes to emphasize safety, injuries remain very common in football. It is increasingly rare, for example, for NFL quarterbacks or running backs (who take the most direct hits) to make it through an entire season without missing some time to injury. Additionally, twenty-eight football players, mostly high schoolers, died from injuries directly related to football from 2000-05, according to the National Centre for Catastrophic Sport Injury Research. Concussions are common, with about 41,000 suffered every year among high school players according to the Brain Injury Association of Arizona. The danger of football and the equipment required to reduce it make regulation football impractical for casual play. Flag football and touch football are less-violent variants of the game popular among recreational players. Both American football and soccer have their origins in varieties of football played in the United Kingdom in the mid-19th century, and American football is directly descended from rugby football. Rutgers University and Princeton University, played the first game of college football on Nov. 6, 1869 in New Brunswick, N.J. Rutgers won that first game, 6-4. Encouraged by Yale University's Walter Camp, the schools began to adopt rules that would differentiate American football from rugby in the 1880s. The scrimmage was introduced in 1880 and the system of downs in 1882. By the turn of the 20th century, football had become notoriously dangerous; 18 college players died in 1905 alone. Colleges responded with a series of rule changes to open up the game, most importantly the forward pass, along with outlawing dangerous formations such as the " flying wedge", and introducing and requiring better equipment such as helmets. The game had achieved its modern form by 1912, when the field was changed to its current size, the value of a touchdown increased to 6 points, and a fourth down added to each possession. Originally dominated by the Ivy League, football soon captured the interest of colleges nationwide. By 1916, when the Rose Bowl game matching eastern and western teams became an annual event, football had developed a national following second only to baseball among team sports. Professional football developed in the mill towns of Pennsylvania and the American Midwest in the early years of the 20th century. The NFL was founded in 1920 in Canton, Ohio. Professional football remained a largely regional sport of secondary importance until after World War II. Television broadcasts greatly enhanced NFL football's national appeal, and the pro game surpassed both college football and baseball in popularity in the 1960s. The first Super Bowl—between the champions of the NFL and the rival American Football League—was played in 1967, and the two leagues merged in 1970.